We all need a good night sleep, but sleep can be hard to find if you’re lying under a dirty bedspread or blanket. 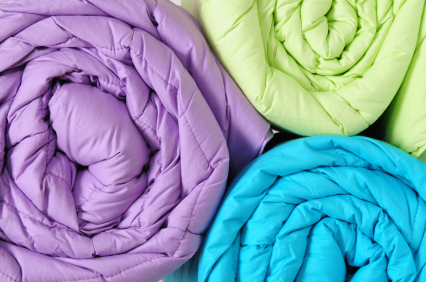 Here are a few tips for cleaning your bedding during your next trip to NJ Laundromats. Bedspreads and blankets are made from a wide variety of fabrics, and most are machine washable. Nevertheless, you should check the label for specific washing and drying instructions ahead of time. To be extra careful, you may want to dip a corner of your bedspread in detergent to check for colorfastness. If the color bleeds, you’ll have to take your bedspread to a dry cleaner. Once you know how your bedspread should be washed, treat it for any spots or stains with a stain remover of your choice before putting it in the washing machine. Again, if it’s your first time using a stain remover on your bedspread, test a small area first for colorfastness. Getting rid of a stain won’t do you any good if your bedspread comes out of the washer all splotchy. Speaking of washers, you’ll want to use a commercial size machine for larger bedspreads, which is why you’ll probably need to head to your neighborhood laundromat to clean most bedding. An overstuffed washer won’t clean as effectively, and the extra water weight is tough on the machine. If your bedspread does require a commercial size washing machine, you’ll also want to choose a commercial dryer for the job. The extra space inside a commercial dryer will ensure your bedspread is evenly dried in the shortest amount of time possible. Of course, if it’s a warm sunny day and you live close to your laundromat, you can always forgo the dryer completely and hang your bedspread on a clothesline to dry. There are few moments as comforting as crawling into a clean bed at night. Don’t put off washing your bedspreads and blankets any longer. Visit one of our NJ Laundromats in Montclair, Teaneck, Bloomfield, or other locations and get the clean you deserve.